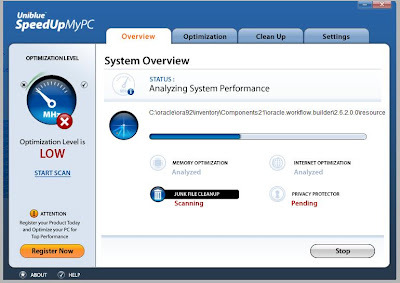 SpeedUpMyPC 3 helps you to optimize your computer performance. It controls and monitors Memory, CPU, Internet usage, privacy files and junk files. This is an easy to use utility software with simple instruction. 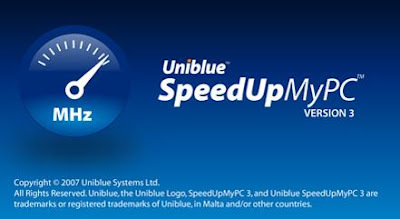 This utility software was developed by Uniblue and they offers free download for trial version. Its price is $29.95. Memory Optimization - Monitors computer's memory usage and controls RAM usage to run demanding applications without interruption. 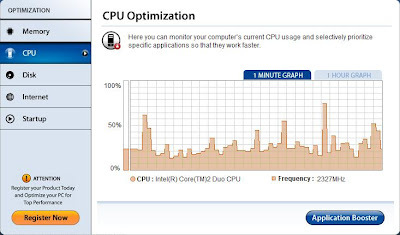 CPU Optimization & Application Booster - Monitors current CPU usage by Applications and assign more resources to specific application. Disk Optimization - You can monitor Hard disk's Input and Output efficiency. Internet Optimization - Allows you to optimize your current bandwidth usage. StartUp Optimization - Remove or disable unnecessary auto-startup applications and services for faster Windows start up. Clean Up - Software scans and remove temporary files, Lost Clusters, Dump files, backup files and Other Junk files.